It’s time to add some excitement to the front entrance! You may recall from our exterior plans that we were debating on whether or not to build a covered porch or just update what we currently have. Well, after drafting and reviewing the plans for a covered porch, we decided to rule out this idea for now. It’s an ambitious task and with a busy summer schedule, we didn’t want to push it and potentially exhaust ourselves trying to get it done. 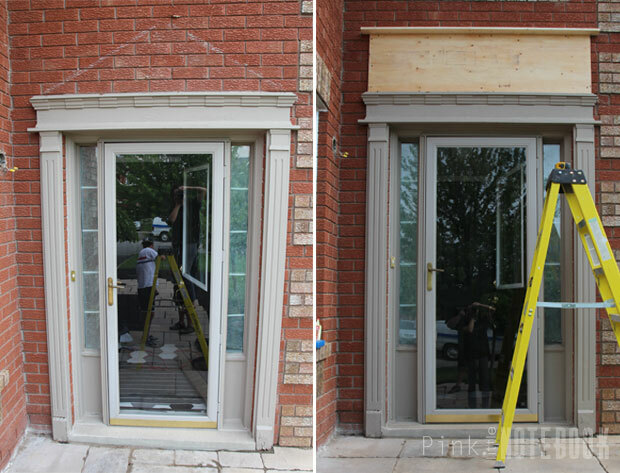 For now, we will be updating our existing entrance, which consists of reviving the surrounding wood molding and updating the front door with a few DIY’s. 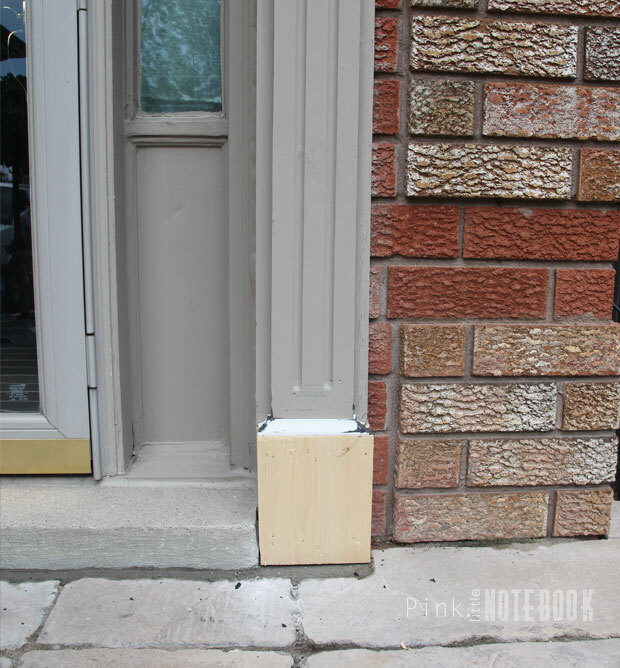 The molding around the front door is still in good shape, minus the rotted plinth blocks at the bottom. The plan is to replace the damaged areas and update the pediment style (the triangular piece at the top) for a more up-to-date linear look. We originally thought the pediment was two separate pieces, which could easily be taken down. Once we started to remove it, everything above the door was in fact one piece of wood. We went back and forth about removing the whole thing but in the end, the hubby just used a reciprocating saw to cut directly across the wood (without touching the brick) to dismantle the piece. I wanted to keep that beautiful trim work on the header! To replace the triangular pediment, we created a new rectangular piece using 1/2″ plywood and decorated it with various trim. 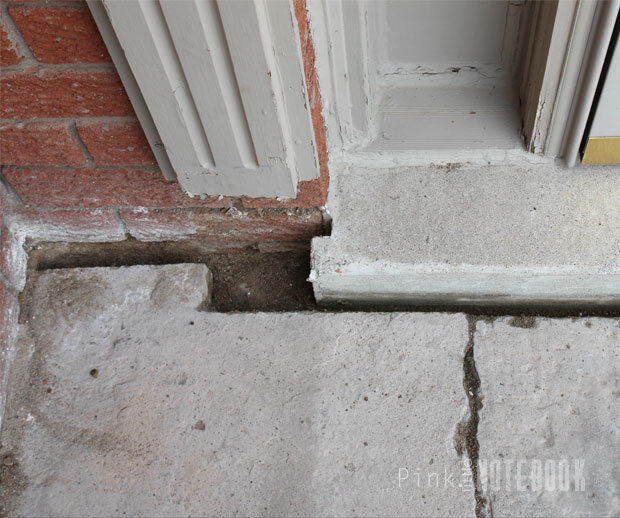 The old plinth blocks were cut out completely and replaced by three pieces of stacked 1″x 8″ wood and finished off with shoe molding. Don’t mind the black stuff, it’s just coloured wood filler. Since we were priming and painting the trim white, I knew it wouldn’t show through. We used the same PARA Paint and primer from our garage door frame and added these house numbers for a decorative touch. 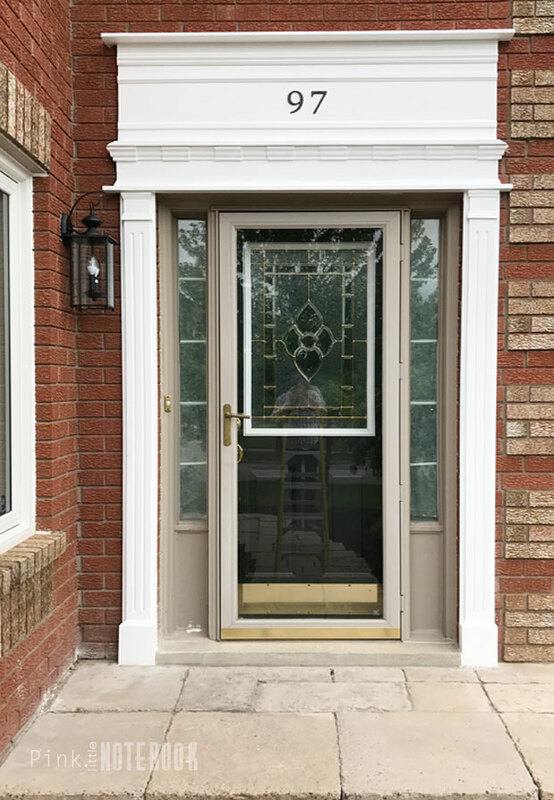 Unfortunately, we didn’t have time to finish the front door but ignore the mismatching door for one second and visualize a white frame with mirrored sidelites and a black front door. It’s going to be one heck of a transformation once I’m done with it. 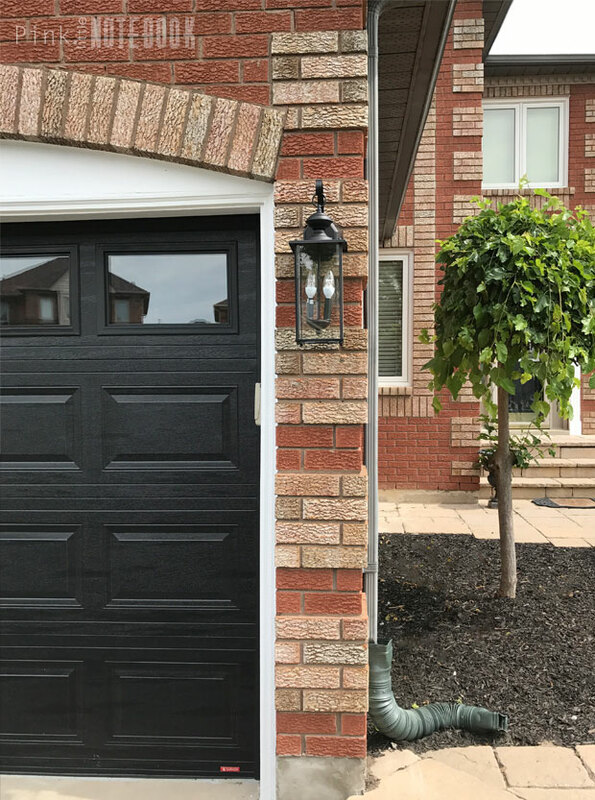 We also updated our light fixtures by the front and along side our GARAGA garage doors. Keeping in line with the transitional style, I’m so excited about these outdoor wall lanterns I found from Wayfair. These heavy duty 20.5″ x 7″ exterior lights make such a profound statement. The clear glass and chandelier lights look amazing at night. I know you guys are probably waiting to see this exterior makeover already. I’m even anxious to just get it done!! I promise the end is near! 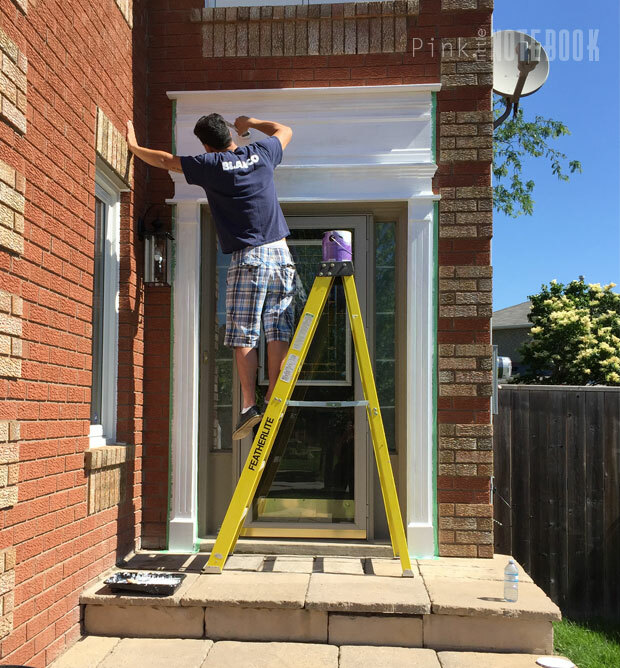 *Click through these links to see more about our exterior makeover: Updating our Curb Appeal, How to Repair your Crumbling Concrete Wall, Our new Garage Doors, Fixing a Walkway with Sinking Stones, Exterior Update, How to Renew your dated Driveway & Curbs, Five Ways to Upgrade your Front Door, Exterior Makeover: Before & After. Disclosure: Thank you to Wayfair Canada for providing our exterior with some awesome light fixtures. All views, opinion and of course, creativity are truly my own. We just put in a new front door at our house and it totally transformed the entire look! Looking really good, what a transformation so far! This looks great! Great transformation! That a difference that made! It looks beautiful, great transformation! We’re meeting with a contractor tomorrow to do some exterior work. I’m looking forward to making a few changes. 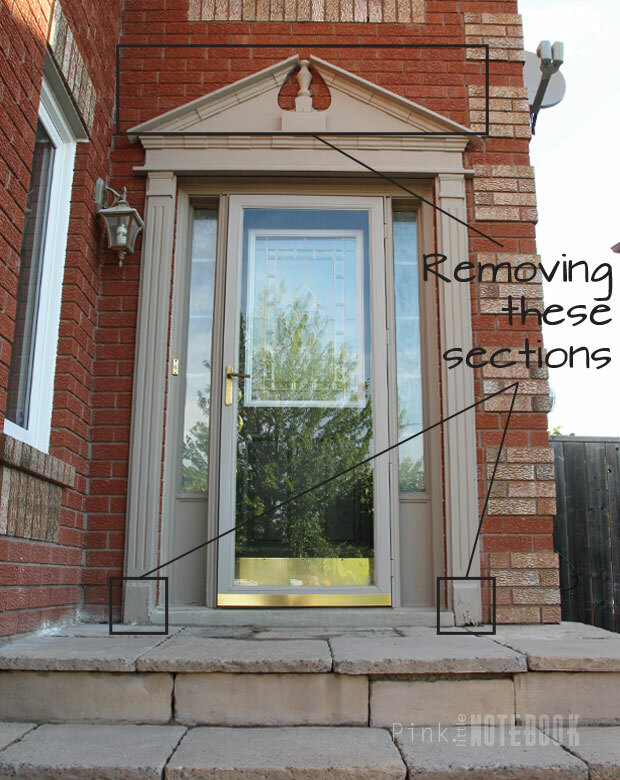 Love your front door update!